Waiting for a better price to go long. GBPUSD_Daily: Looking To Buy Pound Lower preferably in the grey zone. I shall update w/ entries and stops, aiming for just 2R. 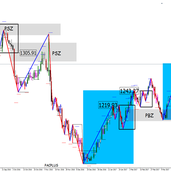 GBPUSD_Weekly: Buy Pound in PBZ. Price is targeting CMLH, 1.4740, I think. January ending was a good buy. April ending still a good buy if price doesn't reach 85.21 by month end. My stops and targets are on chart. Price may go higher, but I'm targeting just twice my risk. I shall update by April ending also. CRUDE OIL_Daily: Possible SP Setup. I'm waiting on other conditions to be met. I shall update on this publication--. my entry and stops. WEEKLY is in uptrend so I feel comfortable about this. Trading below C shifted the argument to the bears side, making current up leg a mere pullback begging for short, but Daily and weekly still bullish. = Still a risky short to me. Gold rises into PSZ----. Risky short though.